If you want to save money in your Hawaii vacation to spend on tours or activities, you should use cheap parking in Waikiki. Doesn’t everyone know the problem of looking for a parking space for ages? Two cheap parking lots in Waikiki. Click to enlarge. But especially in Waikiki it is not easy to find a parking place and a reasonably priced one. Hotels in Waikiki offer parking, but it costs $35 per night, which makes your rental car even more expensive. Therefore, you can find cheap parking in Honolulu at the zoo. Every hour there costs $1. You can park for free at Monsarrat Ave. But you can also rent a bike at Biki for even less! 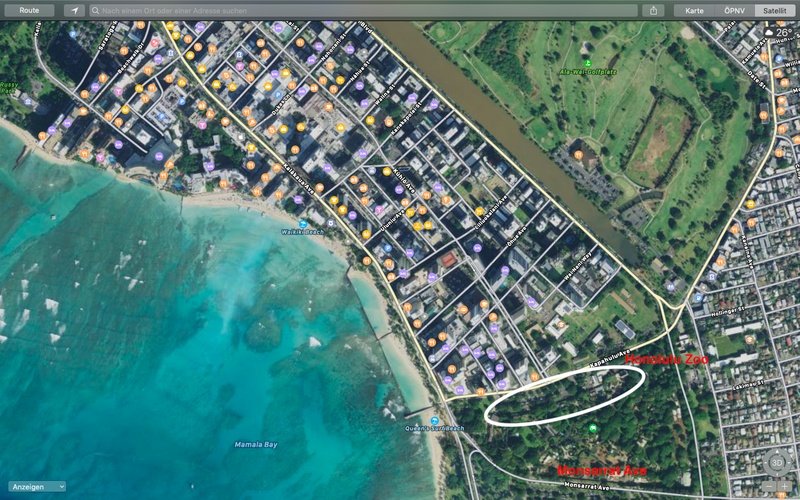 With the Biki you won’t only be spared the search for cheap parking spaces in Waikiki, but you’ll also get from A to B in a great way. 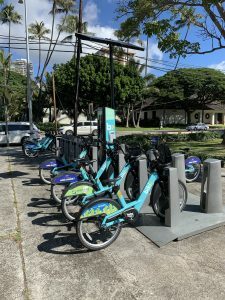 Biki is Honolulu’s newest transport option and was only released at the end of June 2017. Biki has more than 1,300 bicycles which are divided into 130 self-service “Bike Stops” in Honolulu. The Biki is my personal favourite to get from A to B, because you automatically have cheap parking spaces in Waikiki and the rental is very easy. Machine for the purchase of an offer. Go to the machine at the station. If you haven’t already registered online for an offer, you now have the option to select one. Click on “I accept the conditions”, insert and remove your credit card, enter your mobile phone number and postcode, click on “I accept the fee terms” and you will get a 5-digit number code. This is valid for 5 minutes, you can print it out or just take a picture of it. Go to a bike of your choice and enter the code on the left. First the yellow light comes on. As soon as the green light comes on, you can pull the bike out of the station and start your booked minutes. Once you have arrived at your destination, you can return the bike to any station. Simply push the bike into the station and wait for the green light to light up again. That’s it, your bike is locked and time is stopped. In addition to these two options, you can also choose between two other options on the Internet: One month unlimited 30-minute rides for $15, or one month unlimited 60-minute rides for $25. But these are probably less suitable for a holiday. Important Note: You will be charged $3.50 per 30 minutes or part thereof that you exceed on your booked trip. Because of that, my recommendation is therefore the 300 minutes. For this reason you can explore the city without any time pressure and 5 hours is a really long time. 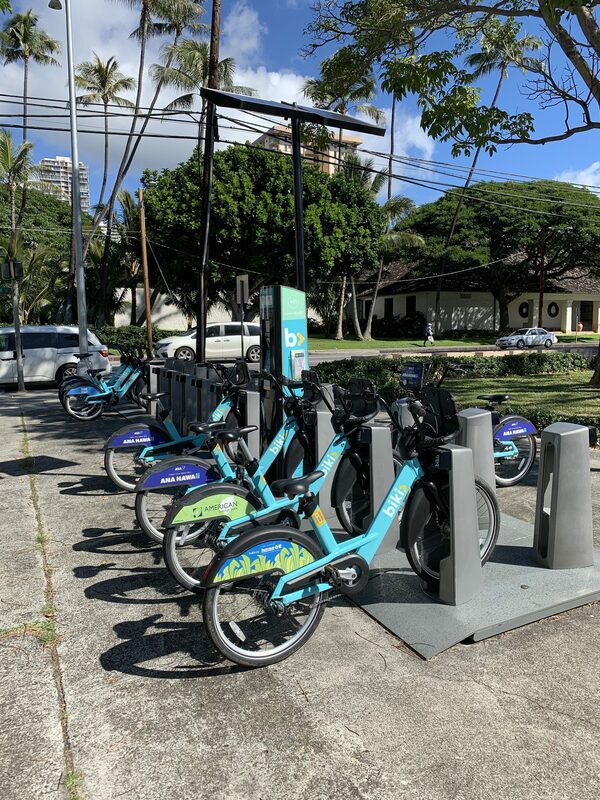 Once you’ve made your first ride and you still don’t feel like lookingfor cheap parking in Waikiki, you can go to any biki station. There you choose the function “I have a pass”. Afterwards you will need to insert the credit card you used to pay for the offer into the vending machine and remove it (you will not be charged anything, only for identification purposes). Now you will see how many minutes of your 300 are left. After that, click on “Get a new Code” and you will get a new code to unlock a bike. Now it’s time to ride again, park until the green light is on, get a new code, ride… and so on until you’ve used up your 300 minutes. 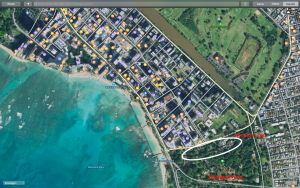 In my opinion, this is a great way to get to know Honolulu better and to explore it better. On many roads there are marked bike paths and at the biki stations there are maps showing you the best bike paths. The bikes are common city bikes that have a kind of basket at the front of the handlebars and are perfect for the city. I would advise against longer bike tours in the mountains, because the bikes are not optimal for this. 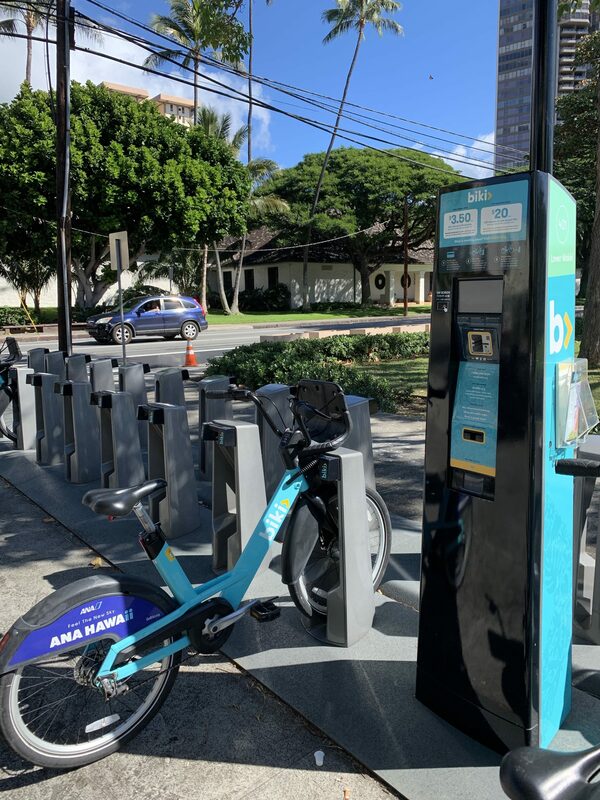 With the Biki you are fast and cheap, and you don’t need to look for parking in Waikiki. Write to us on Facebook if you have any questions! If you don’t feel like riding a bike, DanielsHawaii will take you on a tour in Hawaii.